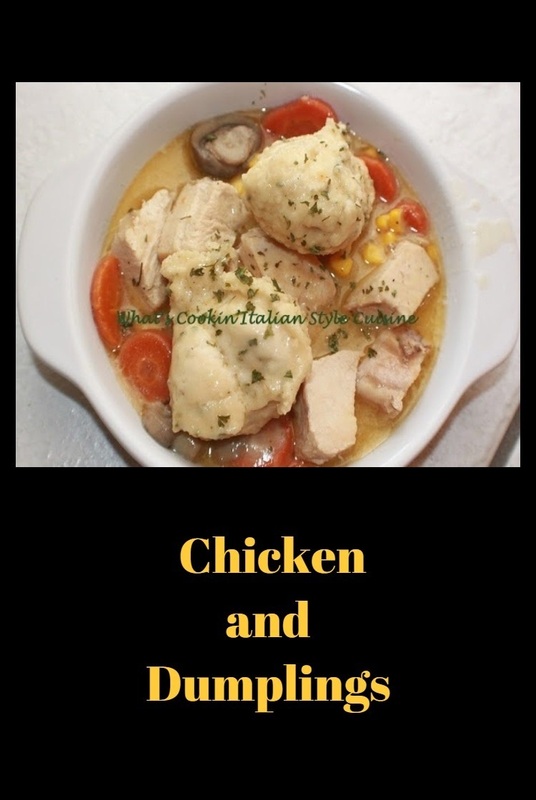 During the last view years, I have craved comfort foods like chicken and dumplings Italian style. This is a hearty dish everyone loves. Of course I had to add an Italian spin of this classic recipe. 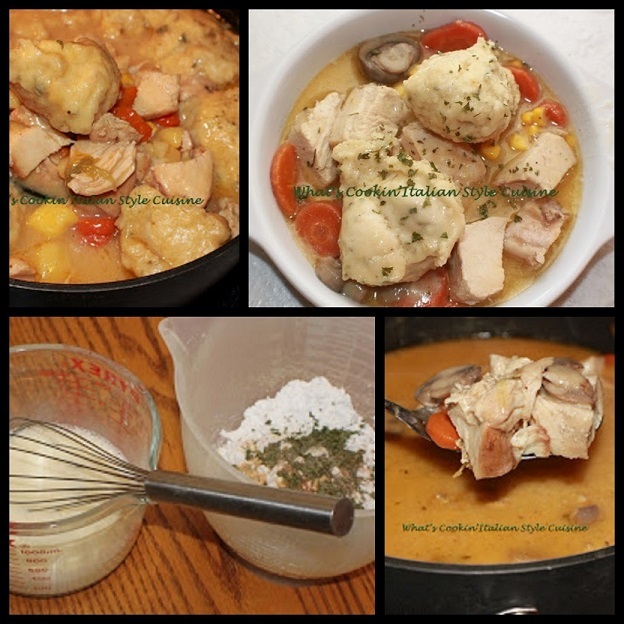 With the flavors in this classic comfort dish of chicken and dumplings you will find an amazing combination of flavors that are unforgettable. The gravy is worthy of just drinking it's that good! Check out the secret ingredient! This is a wonderful comfort food! My future daughter in law requested this dish for her 30th Birthday! 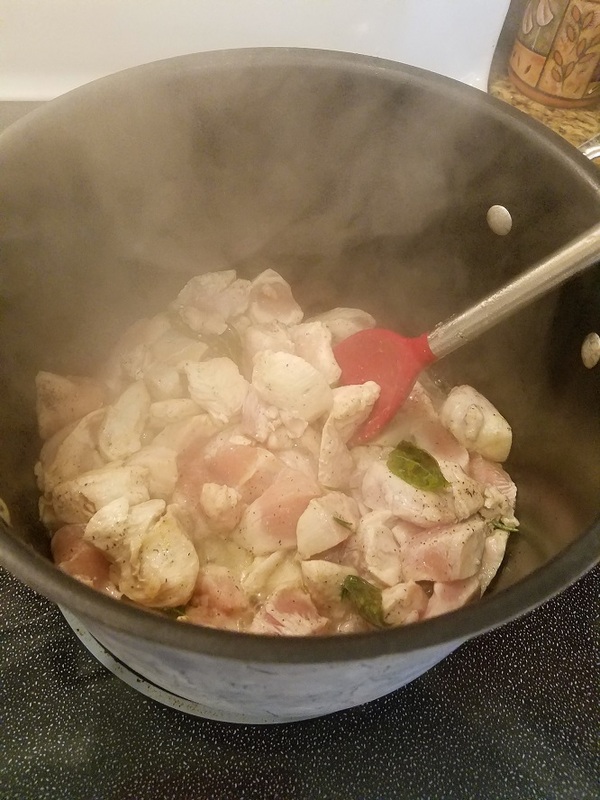 This is my version of Chicken & Dumplings, it has a secret ingredient, well it's not a secret anymore. I was very surprised to see on my first try to make this dish, how easy it was. The dumplings puffed up nicely and the stew part was so flavorful! A Blessing is on the way! I also have another secret that won't be after today (besides wishing Jennifer a very Happy Birthday. She made an announcement to the family that she and my son Curt are expecting their first baby together and the soon to be parents are making me a Grandmother. Having said that I welcome our new addition to the family in February next year with anxious happiness. Congratulations to both of you on your new journey of parenting ahead wishing you both a very happy life together and a healthy future for the baby. The broth is so flavorful, between the vegetables and herbs, I almost want to use this as soup. It really is one of the most comforting foods I have ever made, of course I had to do an Italian twist on this Southern favorite! I add what my family likes for vegetables. Some suggestions I have are mushrooms, green peppers. onions, corn, peas, green beans, potatoes, carrots, celery all diced in small pieces so they cook faster. I am sure you can add mixed vegetables or anything else you prefer. We like a little heat so I like to add cayenne pepper to mine. I never add onions because I am allergic, however I add a lot of extra garlic! I also like to add some grated cheese, herbs and garlic to my dumpling dough! Growing up all Italian, I had no clue what this dish was. To my surprise, she loved how I made them. I was thrilled to make something this new mama was craving and liked! 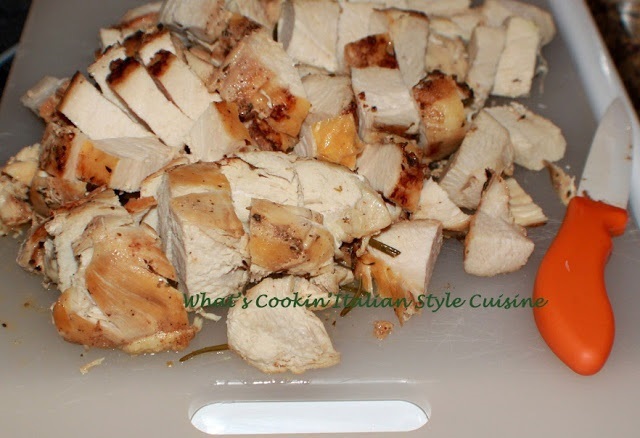 You can roast the chicken in the oven or saute it on the stove. For a real money saver, add water to the sauteed chicken and make your own chicken broth instead of buying it! Saute the chicken in some butter and olive oil until browned on both sides, then add the 6 quarts of water to the pan. Just season it with salt, pepper and the vegetables will give it all the rest of its amazing flavors! 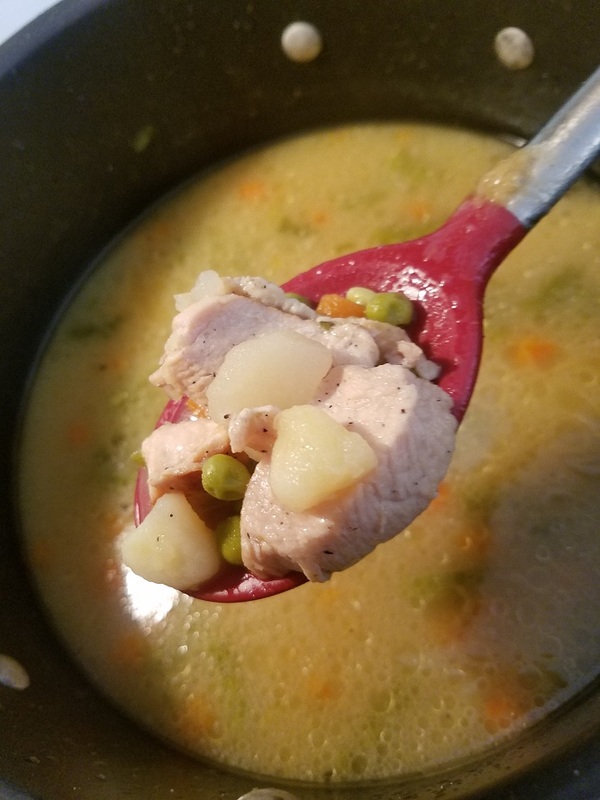 What an easy chicken stew dish! 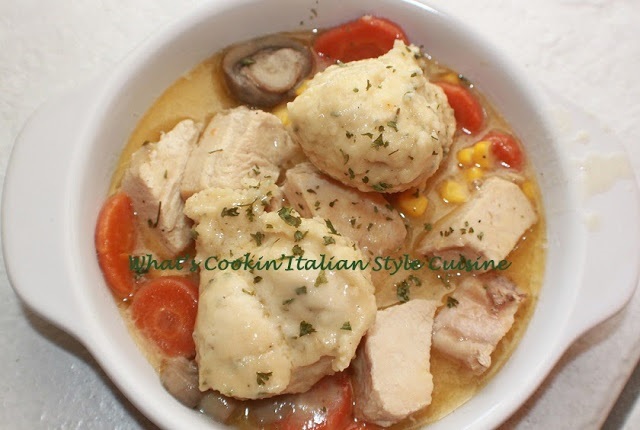 This Chicken and Dumplings Italian Style stew is so easy to make! Biscuits and gravy are a staple in the South. This is bursting with flavors and the dumplings are soft, fluffy and tender. The gravy and vegetables are almost like eating a pot pie in a a bowl! This is really an easy recipe. I love how fast it comes together. I am not one for complicated recipes. I do love however, easy with a great result and this recipe is it! Look no further. Your family will love it as much as mine. It may not be exactly like the classic old fashioned recipe of Chicken and dumplings but it's the tastiest version you'll ever make. The smell alone will make you impatient to wait to eat this! Scratch and Homemade is the best! 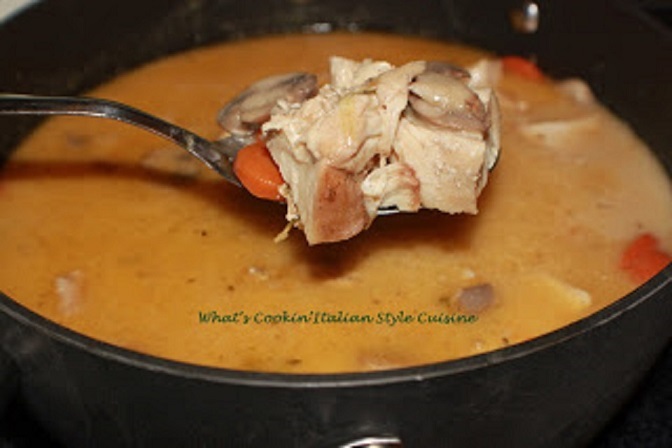 Making this chicken and dumplings Italian style from scratch, was the best. I love the garlic, herbs, spices and the dumplings were so tender and flavorful. My daughter in law who is pregnant loved this dish. The dumplings and broth were perfect! I was so happy it came out great for the first time especially since she is pregnant with my first grand child. There is no doubt I will be making this again soon! Place the chicken breasts on a cookie sheet greased and sprinkle with garlic powder evenly and all the above mixed together, drizzling the olive oil over each piece. Bake for around 45 minutes on 350 or until no longer pink in the middle. Cool. Slice into pieces set aside. In saucepan melt butter, add the oil. Sauté the garlic and vegetables for around 2 minutes. 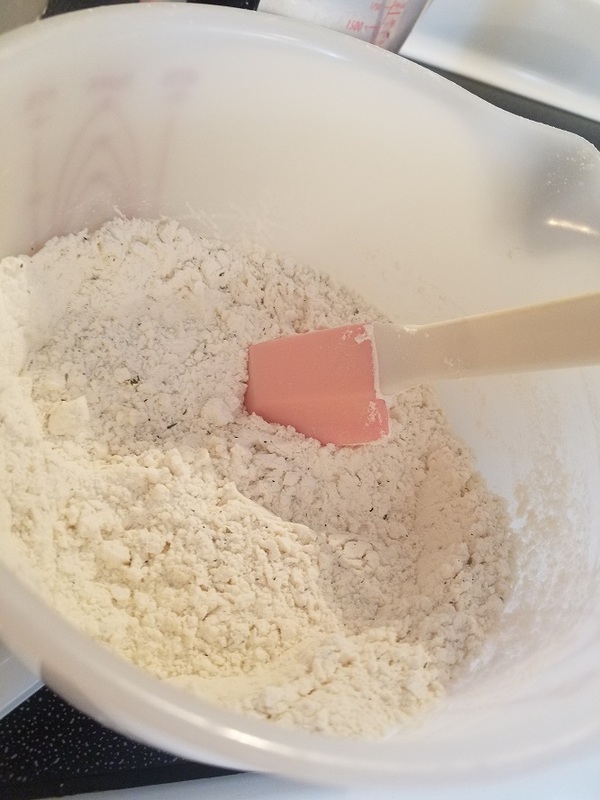 Add the flour and stir. Pour the chicken broth in these vegetables mixture. Add the sherry. Simmer 15 to 20 minutes until the vegetables are soft then add the heavy cream. Fold in chicken. Let that come to a slow simmer. Note: all vegetables are diced very small or sliced fine and thin. Made this yesterday on a cold and dreary day. It was a huge hit! Love this twist on a classic comfort food!! My mom used to make this all the time when we were growing up. She could never get the dumplings right though. Yours looks fantastic! What a delicious twist on an old favorite! Comfort food is my jam, all year long! Pinning this to try ASAP! I can definitely see how a little sherry helps the flavors. Such comfort food. This looks yum. Your grandson most be a big boy now. Will be giving this recipe a try. I still miss your mother's day.God bless Claudia in her recovery. Me. I keep seeing all these yummy chicken and dumpling recipes and I am craving it bad! I love that this one is most like how my mom made it - so good! Awesome recipe! Love the combination of flavors. Thank you for sharing your secret ingredient! I love love love dumplings and this looks like the perfect comfort food! It's soup time! I love this time of year... I could make a pot of soup every night. This looks like a great spin on my family's favorite. 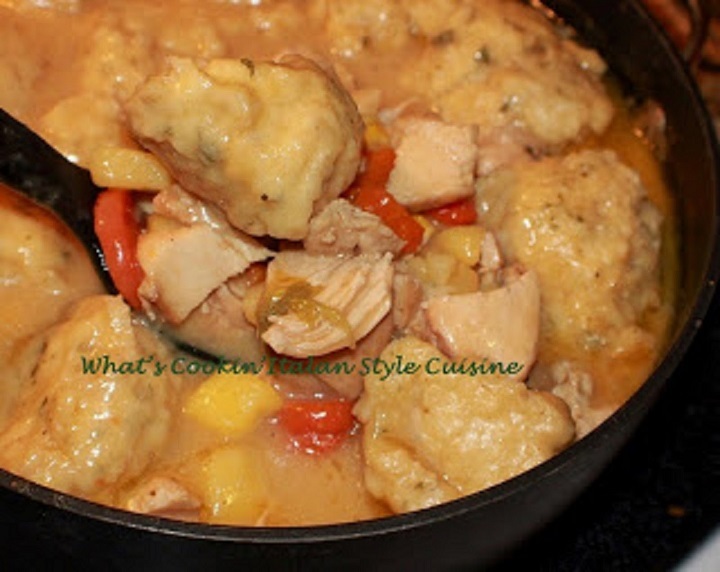 What a delicious CHICKEN AND DUMPLINGS! I simply cannot wait to try it! Very interesting combination of ingredients. I am saving this recipe for later. Wow, this is stunning! I love love love chicken!!! Looks very delicious! Great recipe. I'm delighted! it looks great! Yum! 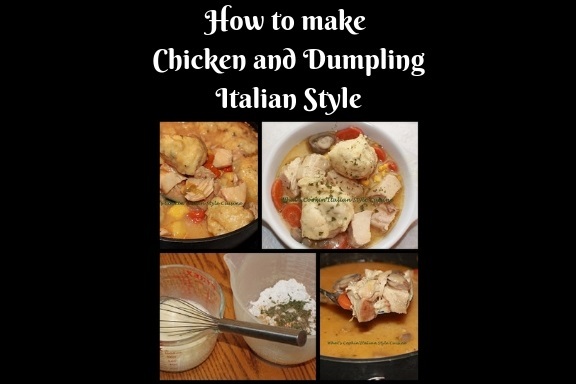 I love making chicken and dumpling but i have never tried Italian style.Sounds yum. Have not made some in ages. Need to try this. It's been so long since I've had chicken and dumplings and these look tasty! 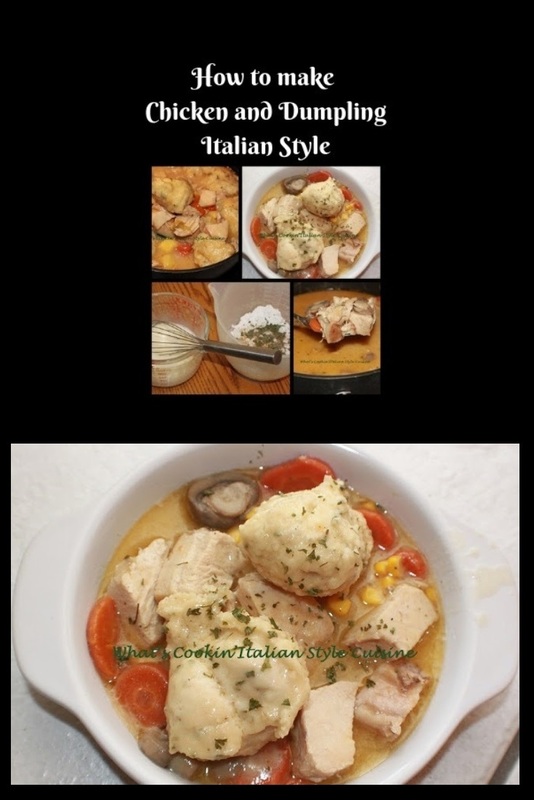 I love the Italian flavors that you've added to these for an excellent spin on a classic dish! Chicken and dumplings is pure comfort food. Growing up we ate a lot of chicken -- that was an affordable meat and mamma used the bones for brodo and our gnocchi were a little different than yours. They sound more like the ones my MIL made -- she was German. And let me tell you, they were excellent too. I'll have to try your recipe.